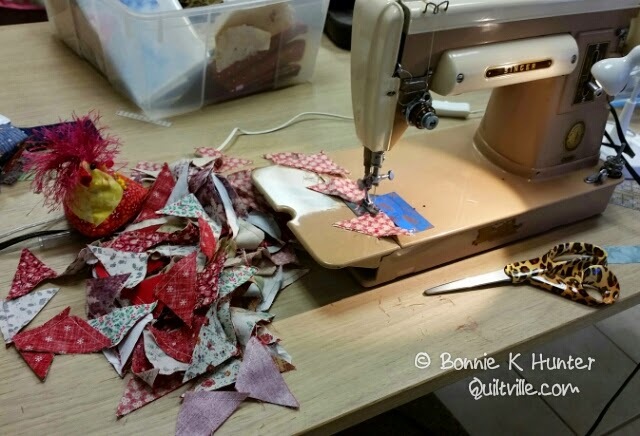 Quiltville's Quips & Snips!! : Galaxy-Gram! Some Stitching on the Mountain! I am just shooting up a few photos before we head out to a progressive dinner with neighbors tonight! I started cutting out these hourglass pairs last weekend when I was up here, today I had some time to sew them together! 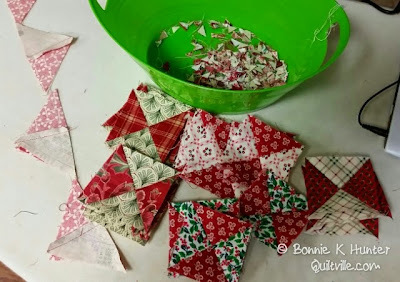 I've got a bunch to do in green and neutral too, it's fun to be working with Christmas fabrics and feeling festive during the holiday season! Yes, I have even succumbed to having Christmas music playing on Pandora while I sew! That's a sure sign of Christmas on the horizon, because I put that off as long as possible! This afternoon we headed out on the ATV's to explore the mountain& I have some photos of that to share tomorrow morning but right now Rick and Mona have showed up and it is time to head out for appetizers at one cabin, salads at another, and dinner at another, finally winding up at dessert at one of our mountain neighbors up here. It's a fun way to meet folks, have a great time, & I don't have to cook! On hold at work so I am reading your blog! I hope your progressive dinner is great fun and relaxing! I have not done one of those, but sounds like something up my alley! Love the tiny hourglasses in Christmas fabrics! Cannot wait to see what becomes of them! My cabin is shut down for the winter, so it's fun to enjoy yours vicariously! Have a great time tonight. You are getting off easy, usually if you participate, you get a course. Lucky you! Enjoy. Love the blocks. 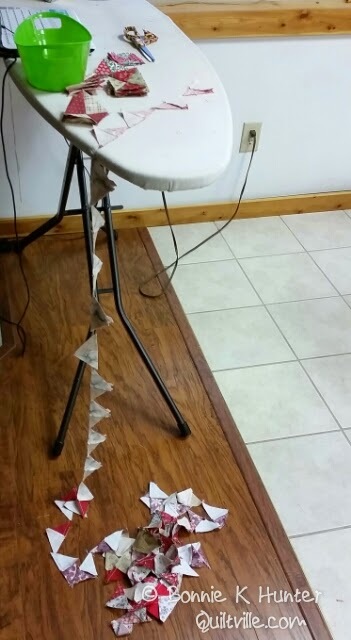 You can't help but be in the Christmas spirit doing those. We finally put lights on our tree tonight and let my grandson put some ornaments on the tree. We have to wait for his brother to finish it up. He is with his father this weekend. Hope you have fun visiting. It sounds like a neat way to do it all. Not too much work for anyone person. So glad you're getting some fun abd chill time! Hope you and Mona got or get some sew time in.....or she's been doing on her own anyway! Enjoy the rest of your time! :-) Save travels back down the mountain! Can't wait to see your pics!